Ryanair Cyber Monday Sale Offers Massive Discounts On Return Flights! You, you reading this now, how much would you like to go to Gdansk? If I were to demand, right here, right now, that we stop beating about this god-awful bush and finally, once and for all, dive into this thorny issue that we've frankly been putting off for too long, then how much would it be? How much would you be willing to fork out to go to Gdansk? If your answer was either in, or hovering sinisterly around the perimeter of, the ball-park of, "I'm largely ambivalent about this, however I suppose, given the opportunity, I'd probably not really be willing to spend anything under €19.61 to go to Gdansk," then you may allow yourself one celebratory fist-pump when I inform you of the news that you can purchase a flight there for €19.60. Truly, these are remarkable times we live in. Naturally however, if you have any intent to return from Gdansk and aren't planning on beginning some new life there then you will need to purchase a return flight. This is where we encounter our second bit of good news of this article - that is already increasingly drifting further and further from its original intent - to inform you of the cut and, indeed, the thrust of Ryanair's Cyber Monday sale; namely that Ryanair are offering €30 off return flights. To avail of this offer on this Monday that, for reasons which remain shrouded in mystery to me, has come to be known as Cyber-Monday, all you need to do is select a destination of your choice from their list of offerings, choose a time of travel that falls between January and May 2019 and book yourself onto the damned plane before midnight tonight. So what on earth are you waiting for, pull your ruddy finger out and - having comprehensively disinfected it - get clicking. 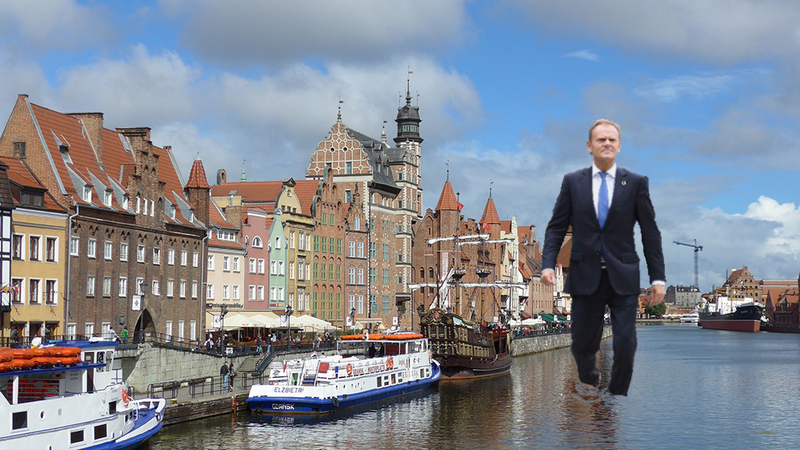 An artist's impression of Donald Tusk strolling through his hometown, Gdansk. *This article was in no way solicited by the Gdansk Bureau Of Tourism. However I am open to the idea of a lucrative sponsorship deal should a representative from same institution wish to contact me.